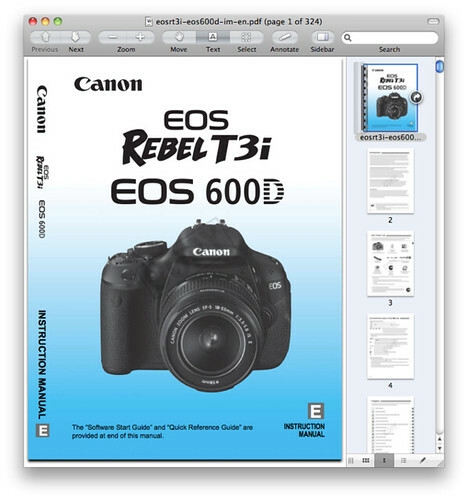 The English Language Canon T3i / 600D / Kiss X5 user manual / operating instructions (Canon calls it the “EOS Rebel T3i / 600D Instruction Manual”) is now online and available for download at Canon.com (right-click and save the user guide to your hard drive). If the download link didn’t work for you, go to the Brochures & Manuals download section for the Canon EOS Rebel T3i with 18-55mm IS II Digital SLR Kit on Canon USA and manually locate the file, titled, “EOS REBEL T3i / EOS 600D Instruction Manual eosrt3i-eos600d-im-en.pdf”. Unlike Nikon, Canon allows you to freely print the T3i owner’s handbook as there is no password protection built into the PDF. There is a watermark displayed on each page though, and re-saving or copying portions of the manual does require a password. The file size of 324-page Canon T3i Adobe Acrobat PDF document is 8.6 MB (Megabytes). The guide discusses the features of the T3i and how to use the camera. It also describes the use of, and camera settings for several optional accessories. 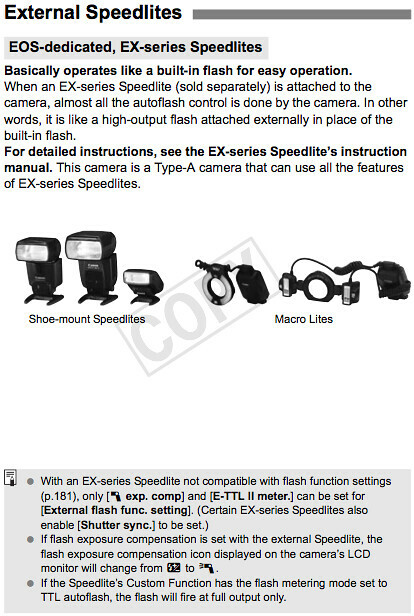 One example is found on Page 263: Canon EOS-dedicated, EX-Series External Speedlites. This particular section talks about the capabilities and limitations of the various Canon Speedlite range of flash units when used with the T3i.